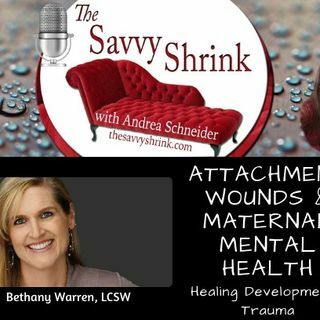 Join host Andrea Schneider and her guest Bethany Warren, LCSW as they talk about attachment wounds and maternal mental health. Some the questions below are topics of their discussion. We also include a recommended reading list. · Why is attachment important? · What are the benefits to the child from secure attachment? · Is it possible to heal from intergenerational patterns of abuse, neglect, etc, particularly as one prepares to then care for ones own child? · ... See More What does differentiating from our parents mean? What does this look like? · Our life experiences change our brain and lay down neural pathways including how we respond to situations and others (including your baby and their need for you). · Does there have to be actual abuse or neglect for there to be attachment wounds? · What can women do to promote secure attachment with their own babies? · What can women do to heal their own attachment wounds? Bethany (Beth) has a passion for women’s reproductive and mental health issues and has worked in this field for around 20 years. She specializes in Perinatal Mood and Anxiety Disorders, working with women experiencing pregnancy loss, infertility, birth trauma or facing adoption or surrogacy. She is passionate about coaching and guiding parents through their adjustment to their new roles and helping women explore and build their core identities, self-worth and self-esteem. Beth also focuses on working with clients experiencing grief, trauma, new or chronic medical issues, and mood disorders in addition to other life stressors and transitions. Beth has an empathetic, compassionate and approachable style and has found EMDR, Cognitive Behavioral Therapy and Short Term Solution Focused Therapy techniques to be very useful in her practice. She also integrates relaxation and mindfulness approaches into her sessions and tailors each intervention to her client’s specific needs. She enjoys facilitating group therapy and has lead postpartum support groups for new mothers and psychoeducation groups for people dealing with anxiety. She also enjoys being active in the community, and currently serves as President of the Postpartum Health Alliance Board. Beth strongly believes in empowering her clients by teaching them useful techniques and tools so that they can become more resilient and healthy in their interactions with others and in their everyday lives. Beth is an adjunct professor at a local University and provides clinical supervision for clinicians working towards their licenses as teaching others in the same field is a passion of hers. She also is frequently featured as a Maternal Mental Health subject matter expert on podcasts and other media outlets. Beth received her Bachelors of Science in Psychology at Colorado State University and her Master’s Degree in Social Work from San Diego State University.